This cleverly designed canvas tote expands to keep food flat for transport. Inspired by the French concept of art de vivre (the art of living), this clever tote for food transport is a tour de force of form and function. 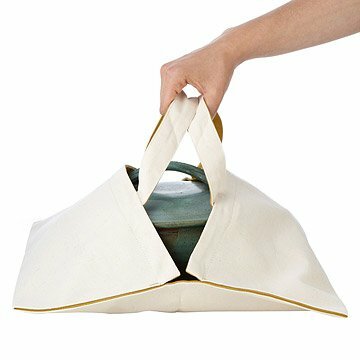 Its origami-like architecture allows it expand to a 14.5" square carrier, perfect for transporting a handmade pie, a meal to share, or any culinary creation that you want to covet from kitchen to presentation. Alternately, the two halves of the bag may conveniently cradle two bottles of wine. Once the goods reach their destination, the plate is removed with simplicity and elegance, as the carrier is designed for the utilitarian in mind, no hardware, zippers, buttons or clasps. Simply cut, fold and sewn. The 100% organic sturdy cotton canvas is washable, reusable, and destined to become an essential for your favorite foodie, chef, or baker. Handmade by Shujan Bertrand in San Francisco, California. San Francisco-based Shujan Bertrand is a true believer in art de vivre, and her designs are a translation of "the daily rituals of sharing good food, drink, and good company." Inspired by the simply made carriers, baskets, bags, and pouches that have been used in European homes for centuries, her totes are a reminder "to find joy and pleasure in making the everyday beautiful." They’re also crafted using zero waste and to last for generations. "Socializing is not a verb but a life philosophy," she says of the French culture she married into, "and where generosity is a daily ritual." Hand or machine wash cold on delicate. Hang/air dry. Thank you Uncommon Goods, We appreciate your support in locally made products and supporting brand that produce goods sustainably, made in the USA.